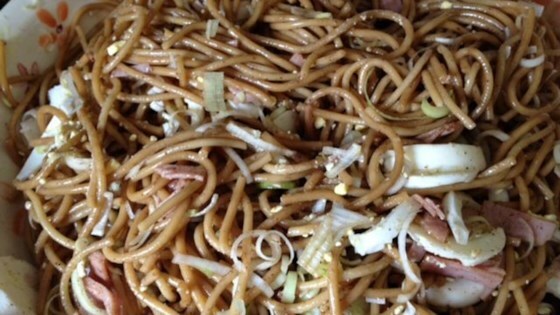 "This Chinese-inspired spaghetti salad is my go-to recipe for any party or potluck. It can easily be doubled or tripled to accommodate a crowd. In my humble opinion, this is the perfect pasta salad." Bring a large pot of lightly salted water to a boil. Cook spaghetti in the boiling water, stirring occasionally, until tender yet firm to the bite, about 12 minutes. Meanwhile, stir vegetable oil, soy sauce, vinegar, lemon juice, sugar, salt, and Chinese five-spice powder in a bowl to make dressing. Drain spaghetti and place in a large bowl. Immediately pour dressing over spaghetti and mix well, so the warm spaghetti can soak up the dressing. Allow to cool completely, about 1 hour. Mix eggs, leeks, and ham into the cold spaghetti and set aside for 1 hour for flavors to combine. Season with dark sweet soy sauce and more Chinese five-spice powder. See how to make creamy smoked ham and butternut squash spaghetti.